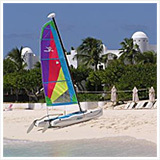 Anguilla is a sensational, but expensive, paradise... definitely one of the most expensive of all the Caribbean islands. 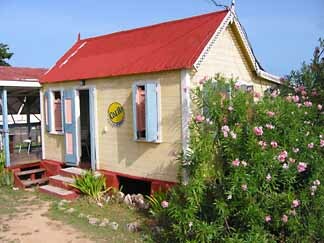 And Anguilla restaurants are no exception. Most tourists only ever experience the expensive (and truly gourmet) Anguilla restaurants. However, there are many alternatives, if you search a bit, and if you're just a touch adventurous. Your rewards will be great eating... and money left over to spend on other fun activities. Lime Keel House serves up mouthwatering seafood & sweet vibes! We've found many cheap-but-delicious Anguilla restaurants on our adventures, from restaurants, to BBQ stands, to food trucks, to Anguilla beach bars and Anguilla beach restaurants. TIP: For more Anguilla food inspiration, follow our Anguilla Food page on Instagram! 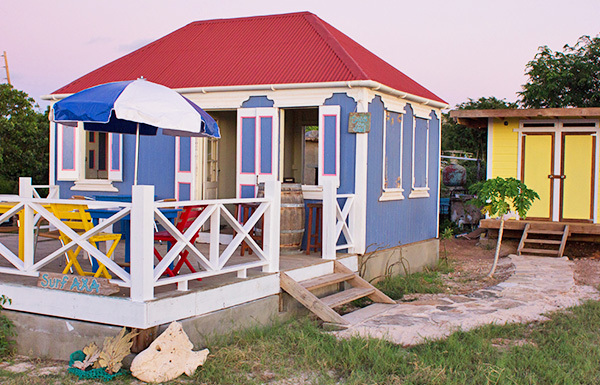 This little blue building is home to one of the most flavorful chicken legs on the island! Places like Ken's Pork and B&D's, as well as just about any BBQ that springs up in front of a house on the weekend, will be super. Just make sure there's a crowd there! B&D's, which is on the road east of Malliouhana, has absolutely delicious ribs -- we picked them clean. Roti is a Caribbean food favorite... (Trinidad origin). But this was the only of all the Anguilla restaurants that specialize in roti. It's delicious -- and you can't beat the price. Ask for their conch roti, it's not on the menu, but it is out of this world. Whenever I leave Anguilla, roti is one of the foods I miss most! 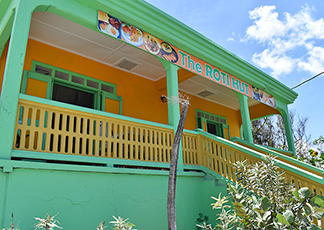 Roti Hut is open from 10am daily and is located across the street from its previous location (see 2002 photo). More favorites for cheap eats? Anguilla is home to tons of terrific and affordable local bakeries. Tried and true favorites include Le Bon Pain, Hall's, Mary's Bakery and Village Bakehouse. Either dine-in or pick up to bring "home." These charming spots are loaded with fresh baked goodies and sizable sandwiches. Below you will see that we have arranged the best cheap Anguilla restaurants according to location on the island, "The Center," "East End," and "West End." 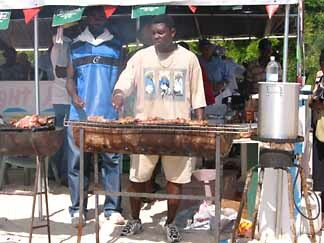 Click the links below for a taste of Anguilla's cheap restaurants. 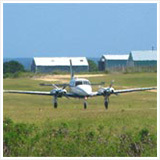 Island Bowls AXA This business is mobile (delivers anywhere on-island, right to your doorstep). Island Bowls whips up sweet and fresh bowls of fruity goodness! Chilled, they make for a delightful and affordable healthy treat on a warm Anguilla morning or afternoon. Sharpy's Shake Shack Setting new standards on The Strip, Sharpy's Shake Shack serves up tasty "island style tapas," entrees and shakes in a vibrant atmosphere, loved by all who visit. Papa Lash Food Van A local favorite, Papa Lash Food Van is a great option if you're looking for a quick, cheap eat. Most of Papa Lash's offerings are vegetarian-friendly too, including tofu pitas, cheese patties and even sweet potato fries. Yum! Valley's Roadside BBQ Referred to by many as THE best BBQ chicken on the island, Valley's Roadside BBQ serves cheap, tasty chicken legs. Valley, the owner, also has Johnny cakes, and on occasion, conch soup. Be sure to secure your chicken (by placing an order) before 11am. These chicken legs go fast! Corner Bar Pizza As the name suggests, Corner Bar Pizza is famous for its pizzas. Located in a small building, deep in North Hill Village, this spot is easy to miss, but really, shouldn't be overlooked. Their pizza is crisp and tasty, and quite affordable. With all the toppings you could want, it's no wonder it's a neighborhood favorite. Tropical Treats Fun House Jahvade Martin, Anguilla-Beaches.com's 16 year old intern shares one of his favorite (and kid-friendly) spots to spend an afternoon, and the only place in Anguilla to enjoy homemade ice cream... Tropical Treats Fun House. Hungry's: Anguilla Restaurant On Wheels... A Fun Idea! A mouthwatering new concept in Anguilla dining. And were we surprised to see who runs it! Mary's Bakery From the savory to the sweet, our favorites from Mary's are her tuna, saltfish and chicken sandwiches. They are tasty and hearty! Karla's at De Reef The only restaurant set on the sea rocks, with an up-close view of the channel between St. Martin and Anguilla, Karla, one of the owners, makes you feel right at home here. Don't just come for the terrific view and company, though. The food is great, too! 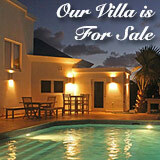 ;-) She serves home-cooked, Anguillian-style cuisine at an affordable price. Dad's Bar & Grill New and friendly, Dad's Bar & Grill is the latest hotspot to join the scene in Sandy Ground. On the beach, drop in for BBQ, boat-watching, music, dancing and drinks. Hall's Unique Bakery One of the island's most popular bakeries, Hall's is loved for their coconut tarts, Johnny cakes and Saturday Saltfish Breakfast. Either take-away or eat in! Zack Shwarma An all-Lebanese cuisine dine-in/take-out spot with late night hours! Tip: Order that which is hot-off-the-spit. Slyco A popular food van in The Valley famous for its burgers and loved for Sly himself, his son and their tasty, affordable menu. Cocono's Anguilla Hearty, homestyle Anguillian cooking that's loved by many. Whether its for stewed oxtail, fried chicken, snapper or king fish you can't go wrong with the mains and sides (plantain, macaroni pie, fries) at Cocono's! Fruity Web Known for having some of the freshest produce on the island, and certainly one of the largest selections, Fruity Web has expanded into a vegetarian restaurant. Tofu and veggie burgers, veggie salads and pastas, eggless banana bread... all is not only tasty, it's good for you too! Ruthy's Yum Yum Tiny and colorful, set on the side of the road to Shoal Bay East, Ruthy's Yum Yum grabs the eye. From staples such as steak wraps to specialties like mahi mahi burgers and tamarind-flavored BBQ sandwiches, the food is excellent, the price unbeatable. The Strip Growing in popularity for nightlife and cheap eats, The Strip is home a fair share of trucks and shacks serving up tasty (and very affordable) eats and drinks, all with a fun atmosphere. Hunter's Food Van One of the top food vans on The Strip, drop in for a quick hot meal of homecooking to go or eat in and try chef Guy's homemade rums! English Rose A popular restaurant set in the heart of The Valley, English Rose is widely loved by locals and for good reason... excellent, hearty food at reasonable prices. TJ's Cafe Home-brewed iced tea (with flavors of raspberry and peach), Saturday Caribbean breakfast specials and regular favorites of hot, home-style cooking, TJ's Cafe is a convenient choice offering excellent value. Good Korma Owned by Serena Banks with a passion for English curries, this charming take-out spot offers mouthwatering Indian appetizers and curry entrées. Jahmaykan Flavaz Jamaican restaurant serving up hearty meals with a wider variety of side dishes, all with convenient service and from a central location. Criss Conch Shack Fresh conch (caught and prepared by owners Criss and Darren that day! ), fried Johnny cakes and local juices... all on the sands of Sandy Ground. You can't go wrong. Tea Box Lounge Not a restaurant per se, this gem of a spot serves up a wide variety of imported and locally-made teas along with sweet treats (the "Hummingbird" cupcake is especially divine!). 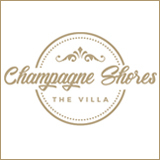 Its soothing setting invites you to stay and sip all day. Cafe 264 THE spot for healthy smoothies, indulgent snacks and coffee drinks, too, in The Valley. New Creations Known for their high end cuisine at some of Anguilla's most luxurious villas, duo Chef Kylon and Lee serve quality food from their bright blue van in The Valley. Le Bon Pain Le Bon Pain is home to our favorite, flakiest, buttery-est croissants! 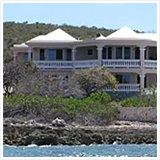 Falcon Nest The stunning view of Island Harbour's azure waters! The setting on the sand! The excellent seafood! The warm company! The price! 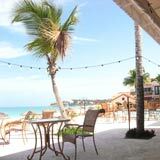 With so many positives, falling in love with Falcon Nest, a brand new beach bar, is easy. The Pelican Bar Right in the sand, The Pelican Bar is the "real deal" spot for eating and hanging like a local. 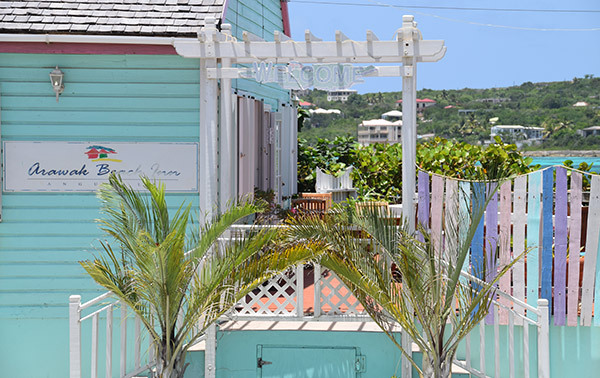 Affordable, friendly, serving the freshest fish, and in the heart of Island Harbour's local fishing village, this is a genuine spot for "liming." Gumbsy's Bar & Grill Open weekends-only, Gumbsy's Bar & Grill serves up some of the tastiest grilled lobster caught fresh that day. Just call up the owner, Mikey and ask him for the catch of the day! 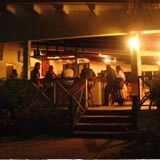 Elodia's Beach Restaurant & Bar A laid-back gem of a beach bar set on the quiet side of Shoal Bay East, Elodia's is a classic Caribbean restaurant. Serving a variety of tasty beach eats at a reasonable price, Elodia's is a top pick for a day on the more tranquil side of Shoal Bay. Geraud's Bakery Geraud serves up some of the tastiest breakfast and lunch options, and a variety of baked goods. Update 2018: Geraud's outstanding pastries, sandwiches and wide variety of French dishes are now all available for delivery directly to your villa or hotel room (storefront is closed). 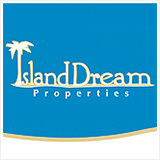 For more on this A+ service, click here. Caribbean Restaurant Serving up Caribbean specialties at a reasonable price, Caribbean Restaurant is a choice spot for a quick and easy bite of hearty Caribbean cuisine. B&D's BBQ An Anguilla institution, B&D's BBQ is one of Anguilla's best and most widely loved for their variety of meats, seafood and excellent side dishes. 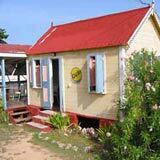 Village Bakehouse Pascal and Suzan Baronnier have created a big following in Anguilla! Loved for their flaky croissants and pillowy breads, their sweet pastries and savory lunch specials can now all be conveniently found in West End. Faustina's Kitchen Specializing in convenient, affordable and seriously delicious smoked BBQ. Island Crave Ice Cream & Dessert Cafe A sweet tooth favorite, specializing in creative ice cream treats, waffles, smoothies and shakes. Lime Keel House Serving up classically fried and extra-fresh mahi mahi with live music and good vibes, Lime Keel House is a must-visit. Each year, come the off-off-season (starting in mid-August), many restaurants and hotels close for a couple of months to repair and rejuvenate their properties. Most cheap restaurants stay open during this time, but a few do close. We keep a full list of restaurants' closing and re-opening dates, updating the list each year. More on off-season hours. 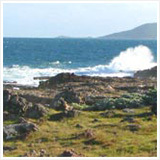 Arawak Beach Inn: One of our favorite tasty, affordable restaurants is the Arawak Beach Inn. for the second time back in 2002! This restaurant is part of the Arawak Beach Inn, which is run by a wonderful, fun English couple, who long ago escaped the grey skies of England. 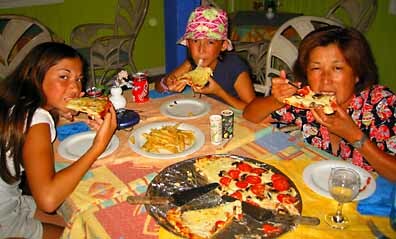 Believe it or not, as crazy it may sound, these "non-Italians" serve pretty tasty pizza, one of the best in Anguilla. As you might expect, their British dishes are delicious, too. Their dessert is one of our favorites... don't miss the Banoffee Pie! 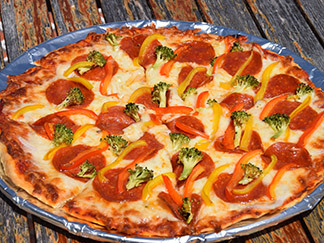 Who would have thought that you would find mouth-watering pizza here, in Anguilla, by "Brits"? During our entire month stay in 2002, it's the only restaurant we visited twice! Years after our first bite into Arawak's pizza and today? The charming inn still has the goods! Crispy, cheesy and sizzling-hot Arawak's pizza is still a go-to. For a fraction of the price of most pizzas in Anguilla, it's a steal of a meal deal. Even though the Arawak is pretty out-of-the way (tucked off in charming little Island Harbor), I would still count it as a "tourist Anguilla restaurant." Which makes the low price even more amazing! Kenny's BBQ Fresh conch soup, garlic bread, ribs, chicken, all under the stars on Sandy Ground, Kenny's BBQ is loved by all, and, since he's open late, most often enjoyed after a night partying at Pumphouse and Elvis'. 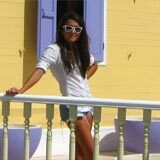 Pumphouse: The Best Anguilla Bar for Anguilla Nightlife Reviewing beach bars for their nightlife value, certainly isn't my area of expertise. There is no doubt though, that this Anguilla bar is a special spot! The beers are cheap, but food prices run a little higher than a "cheap" restaurant. Christobelle's Canteen: True Caribbean Cuisine We've had pizza, seafood, steak and even roti on Anguilla, but never tried authentic Caribbean cuisine... that is, until now! Nico's We discovered Nico's, a fantastic restaurant right near the airport, literally two hours before we left Anguilla. What a lucky find! They had the great sandwiches and hamburgers, as well as an interesting-looking goat stew (not that any of us was brave enough to try it!). Too bad we didn't get a chance to make a return visit. Their breakfast is supposed to be excellent... and very reasonably priced! 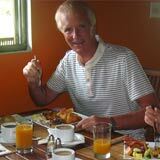 It's hard to find good, cheap breakfast in Anguilla, so we'll be trying it next time back. Since our first visit, I've had several excellent reports about Nico. The final verdict is "great and cheap." And the goat was highly mentioned twice. Fish Shack & Grill An impressive smokehouse home to unique flavors and some of the best beef ribs and most flavorful chicken we've ever tried! Uncle Ernie's: One of the Greatest Beach Bar On the Greatest Anguilla Beach! The best cheap beach-shack restaurant is on Anguilla's most famous beach, and may just be Anguilla's most famous restaurant of all. Natural Mystic Set in The Valley, if you are in the mood for local food and a beer, stop in at this colorfully colored spot. Bamboo Beer Box Genuine Anguillian vibes, terrific cocktails and outstanding BBQ ribs can be found at this beach bar right on the majestic Meads Bay! Little Curry House Doubles! Rotis! Curries! This bright new spot located in The Valley is bringing it all to Anguilla. 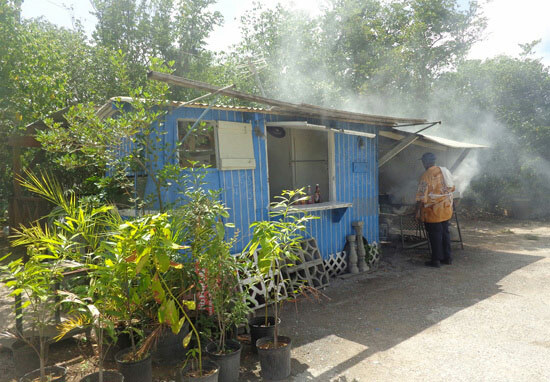 Joan & Cyril's BBQ Pit Stop Looking for the best Anguilla Johnny Cake? Joan and Cyril's BBQ Pit Stop is one of our favorite Anguila Johnny Cakes. It's not your usual Johnny Cake! You can even make a sandwich out of them. Sugar and Spice Bakery and Bistro Serving up sweet and savory treats (including local specialties like shark sandwiches from time to time!) for breakfast and lunch, this spot is affordable and convenient. Don't miss their fresh fruit smoothies and juices. On Da Rocks: A Cool Hang-Out With a View From their large, roof-top terrace that offers endless views of picturesque Island Harbour, to the freshest fish, lobster and crayfish on the island, On Da Rocks has so much to offer. Don't miss their Saturday Special! Note: While their "Saturday Special" is inexpensive, their regular menu has middle-of-the-road prices. "A" Burger... A Premium Burger Joint "A" Burger is Anguilla's only burger joint. Posing serious competition to our favorite island burgers, "A" Burger is a cut above the rest when it comes to quality ingredients, preparation, and a passionate mission and love for Anguilla. Un Amore Cafe One of THE best pizzas on the island, this pizza place specializes in thin-crust pizza. It's no wonder... the owner is from New York, after all! Klassik Cafe: Our Favorite Cheap Eat On A Holiday In Anguilla? There are so many mouth-watering Anguilla restaurants that won't break your budget, but this one is at the top of our must-visit list! Murray's Jerk Centre Ready for a lesser-known fabulous cheap eat experience in Anguilla? Murray's Jerk Centre is delicious, inexpensive and right on the beach in Sandy Ground. Yum Yum A restaurant with a menu that is indeed jam-packed with yum... be sure to bring your appetite! Daisy's Restaurant Set in a traditional Anguillian home with a unique view of St. Martin, dining at Daisy's is an all around Anguillian family experience. Owned and operated by Daisy's family, sample classic Caribbean dishes and their popular pizzas! 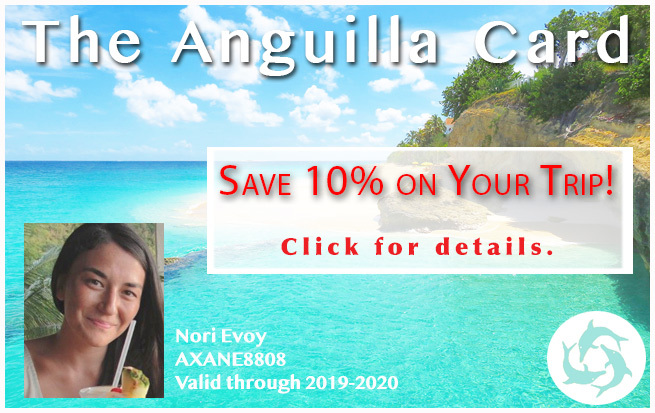 For more on eating affordably in Anguilla, as well as an entire to guide to planning a budget vacation in Anguilla, click here for Anguilla On A Shoestring... A Budget-Friendly Guide to Anguilla. 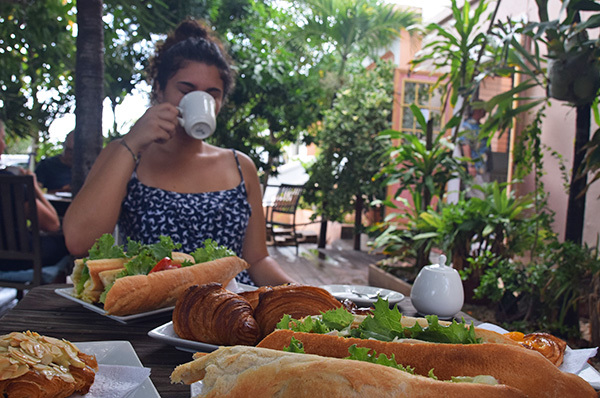 We love reading other travelers' dining experiences! Everybody enjoys reading others' experiences, and picking up new tips and things to try. So, what Anguilla restaurants have you tried? 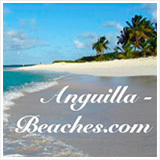 Click here to share your Anguilla restaurants reviews. Or if you know the best place for lobster or breakfast or pizza, add it to our "quick list" of Anguilla-top-eats. Click here to add your favorites to the Anguilla guide to top eats.